A newly released study indicates people who admit to eating the most red and processed meat before a colon cancer diagnosis are more likely to die in the eight years following than cancer patients who ate less red meat. 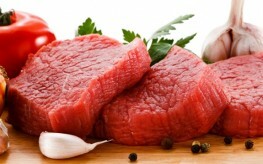 The study is part of a growing body that links red meat with cancers of the digestive system. According to Reuters Health, the study can’t prove with certainty that eating red or processed meat causes colon cancer death, but we do know from previous studies that eating such meats is connected to an increased risk of having a colon cancer diagnosis. The most recent research looked at 184,000 Americans who didn’t have cancer between 1992 and 1993 and data about what those people ate. The researchers identified 2,315 men and women within the group who were diagnosed with colon or rectal cancer between the time the study started and June 30, 2009. Of those, 966 died before December 31, 2010. When looking at diet and mortality rates, the researchers found about 43 percent of some 580 individuals who ate 10 or more servings of such meat per week at the onset of the study died during the follow-up period. This was compared with only 37 percent of the 576 people who ate about two servings of red or processed meats per week. Interestingly, the researchers found no connection between the amount of red and processed meats after the diagnosis and mortality. “The primary message is a confirmation that increased intake of red or processed meat can have detrimental effects on the developments of colon cancer, the type of cancer and other health effects of patients in the long term, “said Dr. Jeffrey Meyerhardt of Dana-Farber Cancer Institute in Boston of the research. He recommends three to four servings a week maximum for most people. In addition to potentially impacting your risk of cancer and your risk of cancer death, red and processed meats could have untold negative health effects, particularly when eaten in excess. If you’re a carnivore and not ready to give that up, eliminate processed meats and seek out organic instead. Also, reduce your consumption and treat meat as a delicacy (smaller portions less often) rather than a staple. You may find that your health improves, as many vegans and vegetarians do.